Historic. 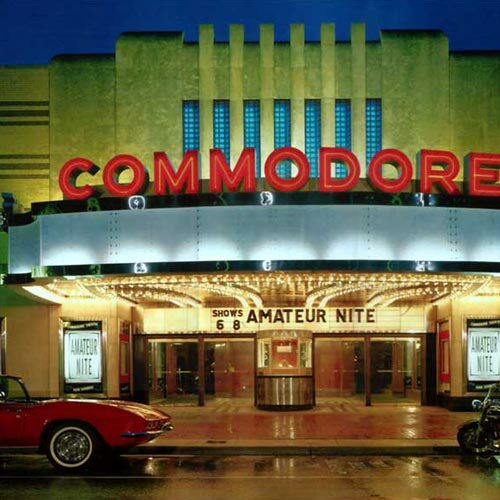 This classic 1940s-era Art Deco cinema is a fantastic place to relax and enjoy a movie. Cozy armchairs on wheels provide ample space and ordering your meal via the tabletop telephone is quaint. The short menu lists deli sandwiches, nachos, pizzas, deep-fried favorites and great cinnamon loaves. Of course there's popcorn topped with real butter—no fake stuff here. Be sure to check out the original murals on the wall before the theater lights dim. Dinner Theatre. Lunch and dinner served. Beer & wine. Entertainment. Accessibility (Call).